An artwork collection based on creative impulses. This collection examplifies the desire to continue my exploration into Clean lines and minimalism. It displays its materials in an unapologedic way to show that less processing and glitter help us reconnect with simplicity. Aluminum, steel and cast iron are presented in a near raw form. 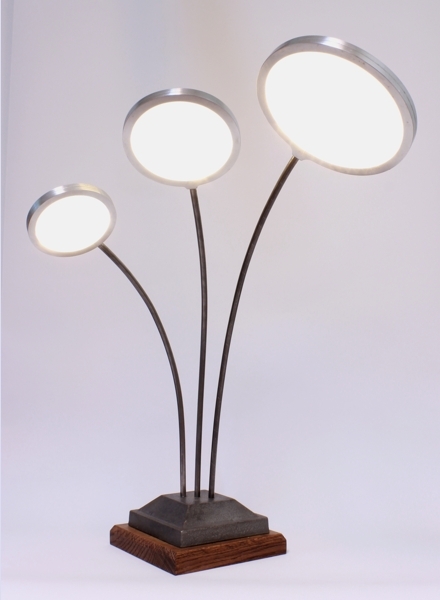 The light surges out of both sides of the disks and provide a very natural glare free lighting. 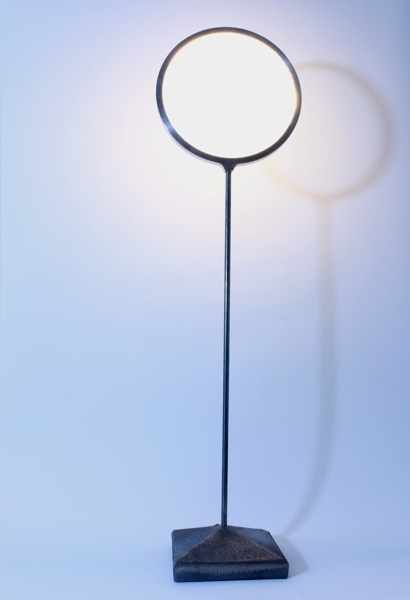 The base of this minimalist lamp is made of cast iron with an oak subbase. The mix of wood and metal gives this piece a vintage industrial flare. The disks are all different sizes. Dimensions: 18" (tallest disk) x 18" wide, base is 5.5" square. 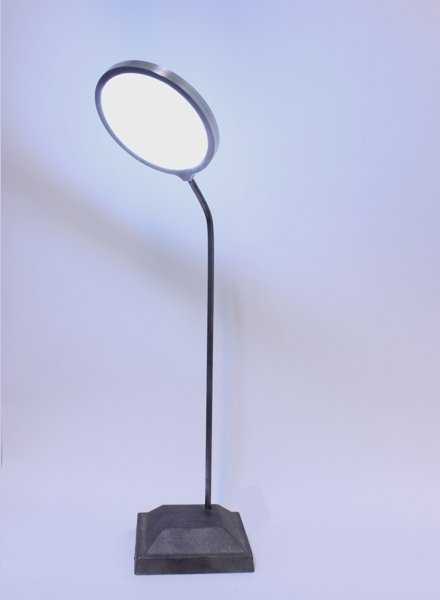 Standing straight with a 6.5" diameter disk, this lamp has the look of an old fashioned magnifying glass. 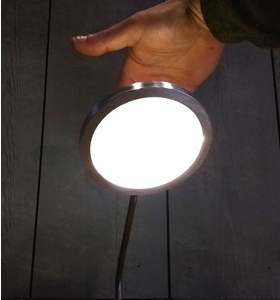 It provides a generous amount of glare free light. 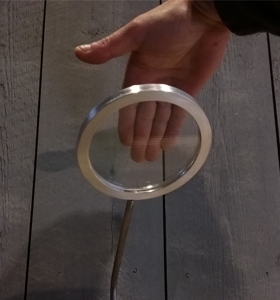 When the lamp is off, it only show a clear window inside the aluminum disk frame. Another great conversational piece. Dimensions: 24" height, 6.5" disk, 4.5" square base. 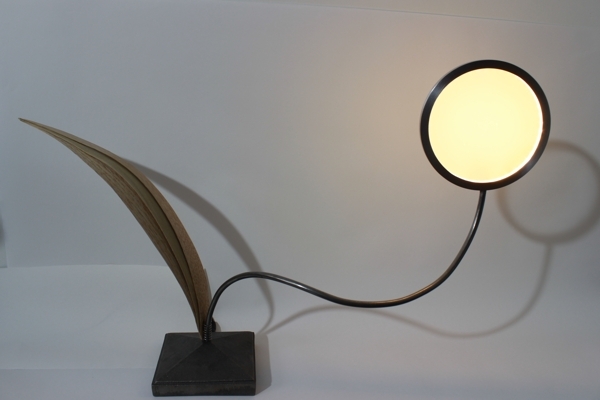 A similar design to the previous piece, this design has a slight bent on its stem to direct the light downward allowing this lamp to be used for accent or reading lighting. Dimensions: 18" height, 5" disk, 4.5" square base. 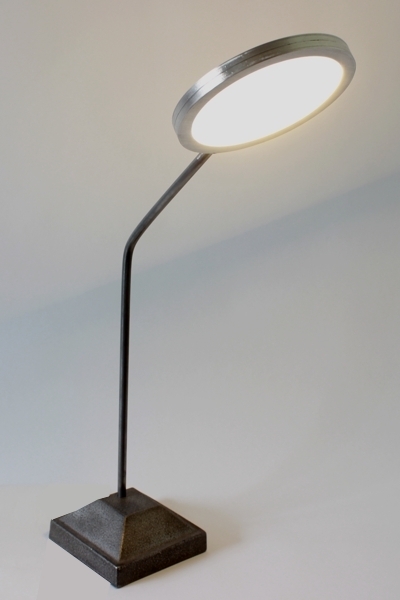 A smaller version of the Geo Bent L above, this lamp is unobtrusive and yet reserves its little secret when it gets turned on. Dimensions: 14" height, 4" disk, 3.5" square base. Vive la difference ! is what this piece is saying. Beauty in curves, assymetry, mixed material such as oak and steel make this lamp a great focal point in any modern decor. Dimensions: 15" height, 21" wide, 5" disk, 4.5" square base.